One of the best parts about my job is the opportunity to train others in the work that I do. I am so passionate about helping dietitians develop skills to become the best healthcare professional they can be and to grow professionally to reach their career goals. I am an official iaedp-approved clinical supervisor and supervision hours will go toward the CEDRD credential. I offer clinical supervision to dietitians interested in training for eating disorders, intuitive eating and exercise, body image, and my own program that I developed based on my nutrition philosophy, the Feel Fabulous About Food program. I also offer business coaching and resources to dietitians wanting to start and grow a private practice. I also offer training for students and can provide advice about the dietetic internship. It’s never too early to explore education, training, and job advice in dietetics! Supervision is a place for open and honest communication. Just like in nutrition counseling, I honor this space and feel privileged you have chosen to share part of your professional career with me. I look forward to getting to know you and help you achieve your goals. You can register for individual sessions, as well as session packages for long-term supervision. All sessions are 45 minutes and are by appointment only. I do offer email support in between sessions, but note longer responses may be saved for our next appointment together. 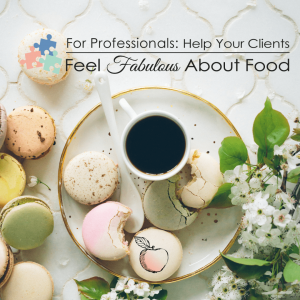 BONUS for Supervision Clients: At any time during your supervision you can purchase any of our online training programs (Pursuing Private Practice for Intuitive Eating and For Professionals: Help Your Clients Feel Fabulous About Food) at a 25% discount. Simply contact Jennifer to get the special coupon code for this.